This paper attempts to identify the major factors associated with some of the failures and successes of integrated watershed management policies and projects with a particular emphasis on the uplands of mainland Southeast Asia. It argues that many policy measures have been misguided by failing to acknowledge the multi-dimensional facets of sustainable watershed management and putting too much emphasis on command-and-control approaches to resource management and one-size-fits-all conservation models. Attempts to introduce soil and water conservation measures, for instance, have largely failed because they concentrated merely on the technical feasibility and potential ecological effects, while neglecting economic viability and socio-cultural acceptance. The production of agricultural commodities, on the other hand, has mostly been market-driven and often induced boom and bust cycles that compromised the ecological and social dimensions of sustainability. Purely community-based approaches to watershed management, on their part, have often failed to address issues of elite capture and competing interests within and between heterogeneous uplands communities. Drawing on a review of recent experience and on lessons from initiatives in a long-term collaborative research program in Thailand (The Uplands Program) aimed at bridging the various dimensions of sustainability in the Southeast Asian uplands, this paper discusses how a socially, institutionally and ecologically sustainable mix of agricultural production, ecosystem services and rural livelihood opportunities can be achieved through incentive-based policies and multi-stakeholder partnerships that attempt to overcome the (perceived) antagonism between conservation and development in upland watersheds of Southeast Asia. In this paper I aim to identify some of the major factors associated with the many failures and few success stories of integrated watershed management policies and projects in the Southeast Asian uplands. Integrated watershed management is defined in the context of this paper as all policies and practical measures that affect upland watersheds as socio-ecological systems with human-nature and upstream-downstream interdependencies. The remainder of the paper is organized as follows: Section II describes the common failures of mono-dimensional approaches to watershed management. Section III outlines three major components of a comprehensive strategy that can bridge the various dimensions of sustainability and bring the state, the market and the community together in support of integrated watershed management. These components are (1) collaborative natural resource governance, (2) payments for environmental services (PES), and (3) rural processing and marketing networks. Drawing on the findings from a case study in northern Thailand, I argue that while none of these components alone is sufficient, the combination of all three approaches in the form of well-orchestrated multi-stakeholder partnerships has great potential to support sustainable rural livelihoods and promote sound natural resource management in the Southeast Asian uplands. Section IV discusses the results and concludes the paper. Many past development and conservation efforts in the mountains of Southeast Asia did not have a long-term impact because they tended to focus on one dimension of sustainability only (Fig. 1) rather than employing a multi-dimensional approach that considers the ecological, economic and social dimensions of sustainability. The mono-dimensional approaches often go along with a one-sided emphasis on the state (in charge of the ecological dimension), the market (covering the economic dimension) or the community (representing the social dimension). Forest departments in Thailand, the Philippines and Indonesia manage 40%, 55% and 70% respectively of these nations’ total land area (Fox et al. 2009). Although the failure of the state-paradigm of forest conservation has become evident, most Southeast Asian governments continue to pursue a command-and-control forest conservation policy. Communal systems of resource management have often been ignored, downgraded and undermined (e.g. Vandergeest 1996; Anan 1998; Neef et al. 2003; Forsyth and Walker 2008). Fuelled by the global environmental movement and local concerns about dwindling forest resources and biodiversity, the area under national parks, wildlife sanctuaries and watershed conservation zones in Thailand was expanded to more than 15% of the country’s territory in 2003, exceeding the average percentage of protected areas (PA) in other Asian countries by nearly 50% (World Resources Institute 2003) and disregarding the fact that the major share of the newly declared protected areas has been inhabited for many decades by ethnic minority people. In many cases, lowland people have taken advantage of the tenure insecurity of local communities and encroached onto hillsides in order to establish large-scale plantations, appropriate land for speculation or engage in illegal logging activities (Neef et al. 2006). In Vietnam and Lao PDR land allocation processes have focused on increasing tenure security for individual farm households, but have largely failed to secure communal forms of forest resource management. To date, the rights of local communities in highland areas to manage forest resources have not been endorsed by law. The governments of both countries have taken measures to phase out swidden cultivation, although long-term research on composite swiddening agriculture (CSA) in the northwestern mountains of Vietnam suggests that CSA is a dynamic system appropriate for less densely populated mountainous areas, in fact causing low rates of deforestation and soil loss. It was found that CSA can actually enhance household resilience and—against all odds—helps to lift people out of poverty (Tran Duc Vien et al. 2006). Efforts of government extension services and development projects to introduce soil and water conservation measures have largely failed in Southeast Asian watersheds because they concentrated on the technical feasibility and potential ecological effects of these measures, while neglecting economic viability and socio-cultural acceptance. In Thailand, 22 technologies and 14 approaches for soil and water conservation on steep slopes available for extension and implementation have been identified in the late 1990s, ranging from mechanical structures to biological methods (El-Swaify and Evans 1999). Twenty years earlier, one of the very first integrated watershed projects in northern Thailand, the Mae Sa Integrated Watershed and Forest Land Use Project supported by UNDP and FAO, had already come up with a myriad of similar agronomic and engineering conservation measures, such as terraces, check-dams, vegetative barriers and mulching (FAO 1976). Yet, rates of adoption have remained miserably low. Demonstration plots with a variety of “sustainable conservation measures” established by the Department of Land Development in cooperation with international projects since the late 1980s in Mae Hong Son province have not convinced local farmers in the area to adopt these measures in their own fields. The Sloping Agricultural Land Technology (SALT) model developed in the Philippines has been exported to Vietnam and promoted as a “best practice” approach (Peters 2001), although its uptake by upland farmers in the Philippines has also stagnated at a very low level. Upland farmers in Vietnam cited high demand for labor and competition with other crops for land and sunlight as the main reasons for the low rate of adoption (Friederichsen 1999; Peters 2001). Today, the classical hedgerow systems of the SALT model are primarily practiced by “model farmers” and found mostly in areas where farmers received subsidies for their establishment (Thai Thi Minh 2010; Saint-Macary et al. 2010). In the early 1990s several authors have already cited the major reasons why farmers do not adopt technical innovations that intend to improve ecological sustainability of upland agriculture, the most prominent among them being (1) farmers practice is equal or better than the proposed innovation, (2) the innovation is technically not feasible, (3) the innovation is too costly and too time-consuming, and (4) social, institutional and cultural factors (e.g. Fujisaka 1994). These factors, however, tend to be ignored by the agricultural research and extension systems which continue to deliver supply-driven “best practices” developed under controlled conditions that rarely stand the test in farmers’ fields. As opposed to the state-paradigm in forest protection and resource conservation, agricultural crops in the uplands of Southeast Asia have been largely left to market forces. In Thailand, for instance, price stabilization measures by the government have focused nearly exclusively on typical lowland crops, such as paddy rice and longan, while farm-gate prices for classical upland crops, i.e. cabbage, litchi and coffee, are formed by demand and supply mechanism and the negotiation power of middlemen. In Vietnam, the booming animal feed industry has become a major driving force for the introduction of high-yielding varieties of corn and the rapid expansion of corn cultivation in the northwestern uplands. Commune extension workers increasingly supplement their low salaries by working under contracts of private seed suppliers (Nguyen Duy Linh et al. 2006; Friederichsen 2009), thus favoring the more commercial farmers and drawing the public extension service into the market domain, at the expense of the more marginal groups of farmers. In Lao PDR, the influence of Chinese investors has increased dramatically in recent years as exemplified by the expansion of rubber plantations on sloping land (Thongmanivong et al. 2009; Friederichsen and Neef 2010). Rubber is regarded by the Laotian government as a viable alternative to shifting cultivation which it vowed to eliminate by 2010. However, the short- and long-term consequences of the rubber boom on food security of the upland poor remain unclear. In Bokeo province, for instance, there are already strong indications that the more entrepreneurial ethnic minority groups, such as the Hmong—partly backed by remittances from relatives in the United States—will be the main winners of this new trend, while the food security and rural livelihoods of recently relocated forest-dwelling groups like the Khmu may be seriously compromised due to a rather slow economic adaptation and a lack of lowland paddy areas, making these groups more dependent on food crops from swidden fields (Friederichsen and Neef 2010). Rubber plantations and their adverse effect on plant biodiversity are also likely to dramatically diminish the availability of non-timber forest products, such as paper mulberry or bamboo shoots, which are important sources of food and cash income at times when food from field crops is not available and households suffer from a lack of liquidity, particularly in the dry season and the beginning of the rainy season (e.g. Neef et al. 2010). Ecologists have also issued warnings against the potentially negative hydrological impacts of rubber expansion (e.g. Ziegler et al. 2009). The one-sided emphasis on market-driven agricultural development has induced typical boom-and-bust cycles in many upland regions of Southeast Asia. In the northern Thai highlands, for instance, opium poppy cultivation was gradually substituted by successions of coffee, corn, litchi, cabbage and—more recently—by sweet pepper, tangerine and cut-flower production. Apart from compromising the resilience of farm households towards price fluctuations and sudden market slumps, the sole focus on market forces as drivers of upland development makes attempts to establish ecologically sustainable cropping systems extremely difficult. In the northern Thai hillsides many farmers have recently switched from fruit-based agroforestry systems to erosion-prone vegetables or to pesticide-intensive production of cut-flowers which currently yield much higher prices than fresh fruits. The Free Trade Agreement for fruits and vegetables concluded between Thailand and China in October 2004 has caused an influx of temperate and subtropical fruits, such as apples and tangerines, from Southwest China which—along with the expansion of domestic fruit orchards—has drastically reduced prices for locally produced fruits (Neeff et al. 2006). In northwestern Vietnam, plum production has been affected by a similar boom-and-bust cycle, causing many farmers to replace them by more profitable and more flexible hybrid corn cultivation with adverse effects on soil erosion and ecological sustainability (Friederichsen and Neef 2010). The boom-and-bust cycles are characterized by a situation where large and innovative farmers are able to adopt a new crop or a new technology first. Risk-averse smallholders, in contrast, often join the boom period too late, at a time when prices have already peaked and start to decrease due to the oversupply in the market. Thus, the major beneficiaries of the new technology are the larger producers, who are able to capture the windfall profit, while small farmers are increasingly trapped in the price squeeze: they have to spend more on input supply and labor, while suffering from already declining prices. As a consequence, their profit margins may not be sufficient to repay their loans, and they will find themselves caught in a downward spiral of indebtedness and declining incomes. This phenomenon—which has been described by some scholars as the “agricultural treadmill” (e.g. Röling 2003)—has become increasingly prevalent in the Southeast Asian uplands, particularly in areas where new technologies have gone along with high initial investments of labor and capital, such as planting of rubber trees in Laos or establishment of greenhouses in Thailand. Hence, what may be regarded as a huge success in terms of adoption of new crops and related technologies often has a differential economic and social impact on adopters. An additional flipside of the Southeast Asian crop booms has been the dramatic increase in land values and the associated rise of large-scale land acquisitions since the mid-2000s in many places (e.g. Hall 2011). The apparent failure of both state and market mechanisms to enhance sustainable natural resource management in the Southeast Asian uplands has stimulated movements towards community-based resource management. The major argument put forward in support of such institutional arrangements as community forestry and community-based water management is that “people who live close to a resource and whose livelihoods directly depend upon it have more interest in sustainable use and management than state authorities or distant corporations” (Li 2002, 265). The comparative advantage of communities is seen in the conservation of common-property resources, such as forest, grazing land and water that are essential for community members’ livelihoods and in the provision of social safety nets for disadvantaged members in times of crisis, e.g. natural catastrophes (cf. Scott 1976). While the state is regarded as an organization that forces people to adjust their resource allocations through command and control mechanisms and the market is seen as an institution coordinating profit-seeking individuals through competition, the community is described as the organization that “guides community members to voluntary cooperation based on close personal ties and mutual trust” (Hayami 2004, 3). While there are numerous examples of successful community-based resource management in the Southeast Asian uplands (e.g. Prasert 1997; Tyler 2006) and scholars have described in much detail the necessary prerequisites for collective action in support of resource conservation (e.g. Ostrom 1990; 2001; Agrawal 2001), critics have warned the advocates of purely community-based natural resource management of being overly naïve about human nature and about existing power relations within local communities. Guijt and Shah (1998, 1) state that the “mythical notion of community cohesion” continues to permeate many development and natural resource management projects that try to follow a participatory ethic and build on the community as the sole organization in support of a more sustainable resource management. It is more realistic to see the community as “the site of both solidarity and conflict, shifting alliances, power and social structures” and of “exclusion as well as inclusion” (Cleaver 2001, 45). The perception of communities as homogeneous, peaceful and equitable entities tends to pay insufficient attention to internal differentiation by gender, ethnic origin, age, and social position and to conflicting interests among the various subgroups. For instance, in a study of the damar forest gardens in Krui, Sumatra (Indonesia), Djalins (2011) finds that the revival of the adat institution—a customary law governing community-based resource manage-ment—actually empowered traditional local elites, while sidelining the common damar farmers and weakening their social position in the community. Similarly, Doolittle (2011) highlights the varying—and often conflicting—strategies of community members in securing their access to land and other natural resources in a study in Sabah, Malaysia. It is also important to take into account that the “village community” is not always the most important reference group of individuals in rural areas. As Francis (2001, 79) holds “collectivities above and below the community level (such as individual, household, lineage, work-group, occupational association) are frequently the critical units for decision-making and action.” For the Hmong, an ethnic group living in South China, Laos, Thailand and Vietnam, membership of a clan is much more important than membership of a village community. Only recently, cooperation across clan (and even ethnic) boundaries has become more frequent, for example in managing small-scale upland irrigation systems (Neef et al. 2005; Badenoch 2009). In some villages in northwestern Vietnam, composed of different ethnic groups due to spontaneous migration and government-driven resettlement, each village group may have an individual “community” leader. In some areas of northern Laos many village communities have been disrupted by continuous resettlements in recent years which have shattered their potential for collective action and community-based management. In the uplands of the Philippines and Indonesia, indigenous people and migrant groups are often forming heterogeneous communities, competing for the same resources and making community-based efforts to protect forest resources difficult if not elusive (e.g. Cronkleton et al. 2010). These are only some examples of the complexity of social structures and processes in rural areas that challenge the overly simplistic view of “village communities.” In response to the criticism of oversimplified notions of community and community-based natural resource management, scholars have developed more diverse and flexible concepts of how communities are “constructed,” encompassing both locality-based and network-oriented approaches to community (Vandergeest 2006). Such differentiations are important contributions that open new pathways towards newly evolving concepts in integrated watershed management, such as co-management and multi-stakeholder partnerships discussed in the following section. Drawing on a review of recent literature and lessons from initiatives developed in the framework of a long-term collaborative research program in Thailand (The Uplands Program), this section presents a comprehensive approach for devising incentive-based policies and establishing multi-stakeholder partnerships that can bridge the ecological, economic and social dimensions of sustainable watershed management in the Southeast Asian uplands. 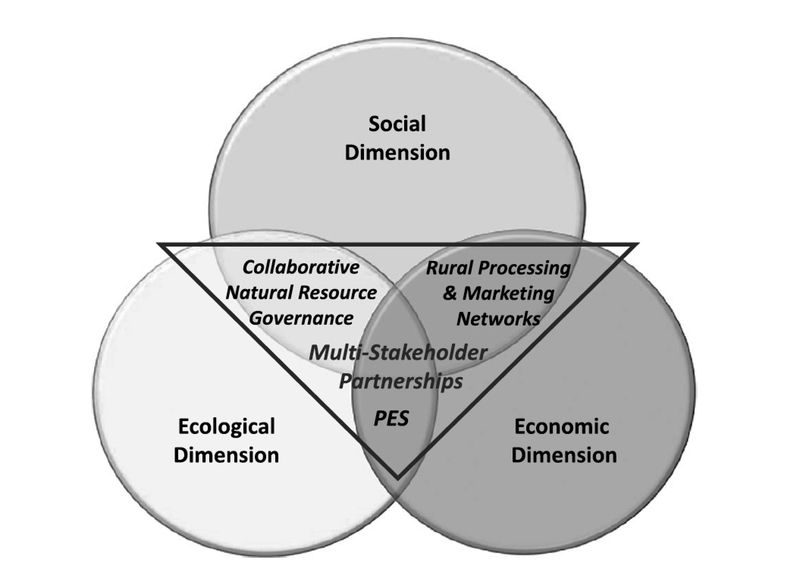 The major elements of this approach are collaborative natural resource governance, payments for environmental services (PES), and rural processing and marketing networks as depicted in the triangle of Fig. 2. 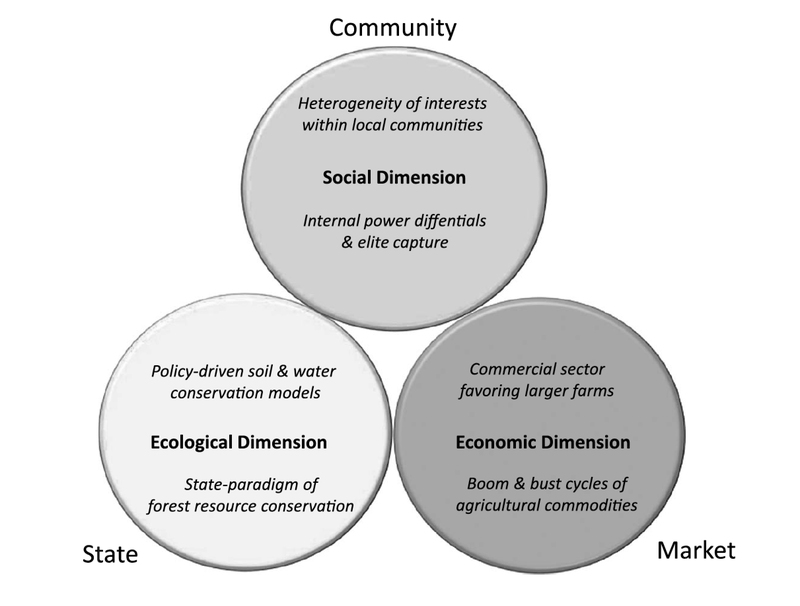 While community-based institutions have a potential for enhancing sustainable resource management in a certain locality if the social cohesion within local communities remains intact and elected local authorities can be held accountable for their actions, the interconnectedness of communities and stakeholders in a watershed context calls for approaches that extend beyond the scale of village territories. Collaborative forms of resource govern ance or co-management arrangements have recently been discussed as alternative approaches towards integrated watershed management (e.g. Persoon et al. 2003; Cronkleton et al. 2010). Such institutional arrangements are based on the realization that leaving common-pool resources to be owned, managed and protected by one single agency or institution is rarely efficient taking into account the multiple services and functions of natural resources for individuals and communities. Collaborative resource governance calls for a holistic approach in agricultural and environmental policies. In Southeast Asian countries, however, agencies responsible for agricultural development, water resource departments and forest agencies traditionally tend to work independently of each other, often being assigned to different ministries; cooperation is rare or even non-existing (e.g. Heyd and Neef 2006). Agricultural policies and allocation of agricultural land are mostly shaped distinctly from forest legislation and forest allocation. Only if these policies are made more consistent and transparent can they provide a basis for the design and establishment of co-management and a more sustainable use of agricultural land, water, trees and forests by multiple users. An important prerequisite for the success of collaborative governance is that policy-makers and officials of the various government line agencies abandon their dual skepticism against the management capacity of local communities in general and, in particular, the potential of marginal ethnic minority groups to conserve natural resources when provided with the right incentives, e.g. in the form of rewards for environmental services, as discussed in the next subsection, and appropriate institutional arrangements, such as more pluralistic governance structures and tenure regimes. Understanding the motivations of individuals and groups to participate in conservation and protection of common-pool resources is crucial for the success of such co-management arrangements. The problem with most co-management arrangements is that the state with its various agencies often remains the most powerful actor, setting the rules of the game. In Thailand, this has become evident in the process of establishing river basin and watershed committees, where stakeholder representation has remained somewhat arbitrary and agendas are still dominated by central government agencies (Neef 2008). Hence, an important question in establishing such co-management arrangements is the degree of devolution of natural resource management to local actors, i.e. to what extent are powerful political actors, such as forest agencies and irrigation departments, willing to release authority, power, and control of resources to less powerful actors at the local or regional level (cf. Agrawal and Ostrom 1999). Enhancing local control of and legal access to natural resources under collaborative governance regimes is also an important prerequisite for the second element of sustainable watershed management in Southeast Asian uplands, i.e. payments for environmental services (PES). Mountain ecosystems are increasingly recognized as public goods, implying that public support for conservation programs and for direct payments for land managers providing environmental services is justified (Heidhues et al. 2006). Payments for environmental services (PES), an approach that tries to overcome market failures in managing environmental externalities, is increasingly discussed as a promising conservation policy measure in the Southeast Asian uplands (e.g. Rosales 2003; Suyanto et al. 2005; Lebel and Rajesh 2009; Neef and Thomas 2009; Chapika et al. 2009). The central argument is that watershed and forest protection creates ecological services, such as carbon sequestration, biodiversity, erosion and flood control, clean drinking water, or landscape beauty, for which providers should be compensated. PES has been defined as a voluntary transaction of one or more well-defined environmental services (or land uses that are likely to provide such services) that are “bought” by at least one service buyer from at least one service provider if the latter secures the provision of such environmental services (Wunder 2005). • Identification of the PES market: Before a PES scheme can be implemented, three basic components need to be identified: the specific environmental service(s) that are “traded,” the potential providers, i.e. “sellers,” of the service(s) and the potential “buyers” of the service(s) that need to have a long-term commitment. • PES processes and relationships: After the identification of the PES market components, several key processes and relationships need to be developed in close collaboration with stakeholders. The type of rewards to be provided must be agreed upon, as well as the specific rules for deciding under which conditions rewards will be allotted or denied. • Institutional environment of PES: This third set refers to the various parameters that characterize the broader institutional context in which a PES scheme is embedded. Trustworthy intermediaries, appropriate legal and regulatory frameworks and secure resource rights have proven particularly important in pilot projects (ibid. ). A cross-country comparative study by Leimona et al. (2009) in the context of the longterm research program “Rewarding Upland Poor for Environmental Services—RUPES”in several Asian countries recommended four important attributes of successful PES schemes, namely (1) realistic, (2) conditional, (3) voluntary, and (4) pro-poor. Yet the authors also found that cash payments in the projects studied were often too insignificant to have a broader impact on poverty alleviation and to provide sufficient incentives for land use changes ( ibid. ; see also Ahlheim and Neef 2006; Munawir and Vermeulen 2007; Milder et al. 2010). These findings have two major implications: first, financial payments for ecosystem services need to be complemented by in-kind rewards, such as allocation of long-term resource rights, human capacity development and/or strengthening of partner ships with forest agencies, which underscores the strong connection between PES and collaborative natural resource governance. Second, PES is not a sufficient means to alleviate rural poverty in upland watersheds and thus needs to be complemented by other remunerative activities. This brings us to the third strategic element of sustainable development of mountain watersheds, the strengthening of rural processing and marketing networks. The future development of the agricultural sector in Southeast Asia is likely to be driven by dynamic economic developments in urban centers bringing about an increase in the demand for high-value agricultural products, like fruits and livestock products. In the uplands of Southeast Asia such commodities with higher productivity in terms of land and labor and competitive product quality will have the best chance of ensuring food security for farm families, even on small farms, by providing adequate agricultural incomes. Upland farmers in Southeast Asia have a long history of simply providing raw materials to lowland areas and urban centers and traditionally depend on middle(wo)men as the main links in the supply chain, leading to patron-client relationships where farmers have virtually no bargaining power with regard to prices. In a recent study of paper mulberry (Broussonetia papyrifera) value chains in northern Laos, we found that 100% of this non-timber forest product (NTFP) was traded via middlemen and less than 5% of the farmers knew what kind of final products were manufactured from the paper mulberry bark (Neef et al. 2010). Most smallholder fruit production in the uplands of northern Thailand and northern Vietnam is traded via market intermediaries that often also play an important role in credit supply and provision with agro-chemicals. Processing and retailing of fruit products have been largely confined to medium- or large-sized companies in peri-urban areas and lowland cooperatives run by the majority ethnic groups (Thai and Kinh respectively). The rapid expansion of supermarkets in Southeast Asia and the emergence of niche markets in the field of organic and fair trade food products both domestically and internationally provide opportunities for upland farming communities to engage in new partnerships with the commercial sector, but individual farmers are often not able to supply sufficient quantities and are ill-prepared in coping with higher quality, i.e. food safety, standards. They are also in a weak position to negotiate higher prices, given the power differentials between smallholders and large retailers. While contract farming arrangements have become popular in the more accessible parts of the Southeast Asian uplands,2) few studies and even fewer development efforts have paid attention to the possible role that village cooperatives and inter-village networks could play in negotiating better terms of trade for small farmers in Southeast Asian upland watersheds. Vermeulen et al. (2008) hold that small-scale farmers need to be integrated into modern value chains by more inclusive and transparent multi-stakeholder processes. Ideally, upland farmers would need to build on and strengthen their social capital, form processing cooperatives and marketing alliances, and engage in new economic networks and partnerships with public and private actors. In setting up such multi-stakeholder partnerships, the provision of services and investments that help upland people overcome isolation and get access to information, innovations and output markets are of crucial importance. As in the case of the other two elements of the sustainable watershed management approach—i.e. collaborative natural resource governance and payments for environmental services (PES), described in subsections III-1 and III-2—effective collective action mechanisms and trustworthy intermediaries3) are crucial prerequisites for success of such multi-stakeholder networks. In the following subsection, I provide empirical evidence of how multi-stakeholder partnerships towards sustainable watershed management can work in practice by combining the three strategic elements in a comprehensive approach and by attempting to balance the interests and capacities of actors whose relationships have traditionally been characterized by strong power differentials. The case study does not claim, however, that such multi-stakeholder partnerships are a panacea for solving all problems related to upland watershed management. Rather than presenting an idealized and one-size-fits-all framework, the case intends to illustrate the principles of a more integrated approach to watershed management in the Southeast Asian uplands that does justice to the heterogeneity of actors and the ecological, social and economic challenges facing these areas. Ban Mae Sa Mai and Ban Mae Sa Noi are two Hmong villages located at around 1,200 m above sea level in Mae Rim district about 35 km northwest of Chiang Mai city. Although administratively divided into two villages since the mid-2000s, the more than 200 families have a history of forming a single settlement. Being within the boundaries of the Doi Suthep-Pui National Park (Fig. 3), villagers have virtually no secure land titles, but are allowed to practice agriculture to a certain extent, as they had settled in their present location before the establishment of the park in 1981. After opium cultivation was phased out in the 1970s, farmers mostly have grown litchi trees4) and various kinds of vegetables as cash crops. Despite their reputation of being notorious shifting cultivators and forest destroyers, the two Hmong villages have a 25-year-long history of forest conservation in close collaboration with both state and non-state actors. Their ancestors have practiced the ntoo xeeb (pronounced as “dong seng”) ceremony for 200 years. This ceremony is dedicated to the guardian spirit of the village, believed to reside in the tallest tree on the hill above the settlement. In 1985, the shaman responsible for the ceremony together with local leaders declared an area of about 16 ha surrounding the ntoo xeeb to be a ritual forest, where villagers are not allowed to cut any trees. In the early 1990s several village members established the “Natural Resource and Environment Conservation Club,” an organization that encouraged fellow villagers to use forest resources in a more sustainable way. The protected area around the ntoo xeeb was subsequently expanded to nearly 400 ha and various forest rules and penalties for trespassers were drafted (Prasit 2004). The annual ntoo xeeb ceremony was widely publicized and promoted among district and sub-district administrators and representatives of various government line agencies. The traditional ceremony of worshipping the village guardian spirit was thus redefined into a manifestation of local people’s determination and ability to live in harmony with nature and protect forest resources. In cooperation with National Park authorities, firebreaks were established to protect both the state-managed forests and the communally protected forest areas. Fire protection activities have been carried out annually from January to May since the late 1990s. In 1997, members of the “Natural Resource and Environment Conservation Club” got acquainted with the Forest Restoration Research Unit (FORRU), an international NGO affiliated with Chiang Mai University. The NGO supported the establishment of a community-based tree nursery to produce tree seedlings from local species for reforestation purposes. Between 1998 and 2006, over 65,000 trees were planted on more than 20 ha of former swidden cultivation land (FORRU 2009). The World Wildlife Fund Thailand, the PATT Foundation and several private companies have since sponsored a number of forest restoration activities, including the establishment of a “Nursery and Education Centre” in 2007 and annual tree planting days. For instance, a local news magazine— Citylife Chiang Mai—has financially supported the planting of 0.56 ha of forest annually since 2007 (Chiang Mai News 2011). This area is capable of storing about 268 metric tonnes of carbon, thus offsetting the company’s annual carbon output. The case exemplifies that local payments for environmental services (PES) schemes can be realistic, conditional, voluntary and pro-poor as postulated by Leimona et al. (2009), particularly when a trustworthy organization—in this particular case an international NGO—acts as an intermediary partner. Conditionality and voluntariness on the side of both suppliers and buyers appear to work best in such a user-financed, localized PES scheme, in which the service buyers are the actual service users—as opposed to government- or donor-financed program where the service buyer is a third party. 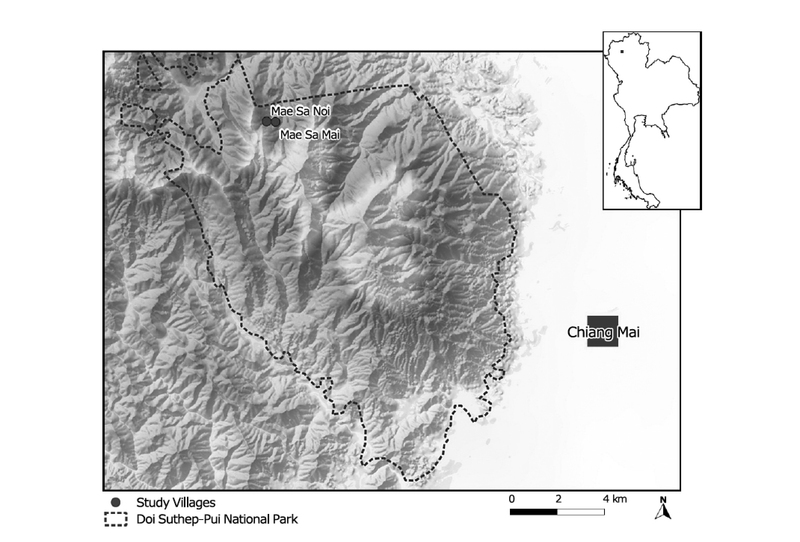 The two Hmong communities were also part of an empirical study conducted by Chapika et al. (2009) that found that upstream farmers in the Mae Sa watershed (which partly overlaps with the boundaries of the Doi Suthep-Pui National Park) would be willing to change their farming systems to more sustainable and environment- friendly practices on parts of their land (e.g. by planting grass strips against soil erosion and by adopting bio-insecticides and water-saving irrigation techniques) if adequate financial compensation was provided. An interesting finding of this study was that the poorer groups among the upstream farmers were more likely to engage in PES schemes, because payments would provide a rather secure and regular benefit stream and the establishment of such schemes would enhance their tenure security in this protected watershed area. If such a PES scheme could be implemented in the Mae Sa watershed, farmers in Ban Mae Sa Mai and Ban Mae Sa Noi would benefit from an annual flow of PES funds for conservation-oriented agriculture, in addition to the payments supplied by private companies for their annual tree planting activities. In sum, the integration of collaborative forest management and payment for eco-system services in this multi-stakeholder partnership has provided the two ethnic minority communities with moderate financial and strong institutional support to enhance their livelihoods and build up a new reputation as forest guardians and environmental stewards, while contributing to an improvement of ecosystem services that are beneficial both for local residents and for downstream people and the wider society. The two elements covered by the FORRU-initiated partnership were complemented by another multi-stakeholder alliance—described in the following subsection—supported by an international research program and focusing on sustainable farming and agro-processing practices. Researchers of the University of Hohenheim’s Uplands Program5) together with Thai partner universities have worked with the same two Hmong ethnic minority villages (i.e. Ban Mae Sa Mai and Ban Mae Sa Noi) over a period of more than 10 years towards developing more environment-friendly agricultural production, with an emphasis on fruitbased agroforestry systems. However, litchi production systems in the area have faced a number of challenges in recent years, such as irregular yields, inadequate use of agrochemicals and declining trends of farm-gate prices for fresh litchis. As a consequence, some farmers had already turned to growing vegetables, such as bell peppers in green-houses and carrots, cabbages and lettuces on steep slopes, which—from an ecological point of view—are a much less sustainable alternative in erosion-prone hillsides of northern Thailand. In 2007, several subprojects of the Uplands Program joined forces with Hmong villagers and various public and private actors to establish a network for community-based litchi processing and marketing in order to add more value to their fresh produce. Villagers from Ban Mae Sa Noi and Ban Mae Sa Mai were trained in litchi drying by the Faculty of Agro-Industry, Chiang Mai University. With support from the Uplands Program and its Thai partners the villagers have developed their own brand of dried litchi. Consumer acceptance studies have been carried out in order to analyze the market potential of such products. The added value is intended to help participating villagers to sustain their fruit production systems. The cooperative—which started with six households in 2007—expanded to 32 members in 2009, 25 of them being women who are known to be traditionally marginalized in the patriarchal Hmong society. In 2008, the cooperative became one of 10 finalists among 383 applicants in a global competition for the socalled SEED award, an initiative of the United Nations’ Commission for Sustainable Development, supporting promising local, multi-stakeholder initiatives towards sustainable development. In the 2010/2011 season, sales of dried litchi have generated revenues of around 30,000 Thai Baht (~US$950). In 2011, a researcher from the Uplands Program has brokered negotiations with a large European fair trade company that wants to include dried litchi from the cooperative in their product portfolio. This initiative is likely to further boost the cooperative’s success and may lay the foundation for an expansion to other villages. Yet a key constraint remains the uncertain legal status of the two communities which poses difficulties of registering the drying business under the Good Manufacturing Practice (GMP) certification scheme needed for sales in most retail outlets. The Uplands Program together with its Thai partners has lobbied for a confirmation from the National Park authorities that the two communities have the right to permanently settle in their present location. In order to improve prices for fresh litchi, the Uplands Program also initiated collaboration with a large hypermarket chain that aims to buy directly from growers, thus bypassing the middlemen and guaranteeing higher prices. The prospect of higher financial benefits has motivated farmers from several Hmong communities to comply with Good Agricultural Practices (GAP) guidelines monitored by the officials from the Department of Agriculture. They have organized themselves as an inter-village litchi growers’ network and adapted their cultivation methods and post-harvest practices to the buyer’s standards. By the end of the 2009 season, more than 100 litchi growers had formally registered for GAP certification. Due to their greater bargaining power as a coordinated group, Hmong growers received fairer and more transparent prices and gradually gained social recognition as a reliable partner in marketing ventures with large supermarket chains (Tremblay and Neef 2009). In 2010 the network traded more than 100 tonnes of fresh litchi via this new marketing channel, generating revenues of over 2 million Thai Baht (~US$62,500) for its members. A welcome side effect for the hypermarket chain was that it could advertise this new partnership with smallholder litchi growers on its website to improve its corporate image. With support from the Uplands Program and its Thai partners, first contacts have also been established to connect Hmong litchi growers with European importers of eco-friendly fruit products. In 2010, the project started—in cooperation with a Thai export company—to promote GlobalGAP-certified fruit production for export to further enhance profitability and ecological sustainability of litchi farming. Initial setbacks—a first shipment of certified fresh litchi was rejected by the importer because one farmer did not comply with the strict agrochemical regulations—could be overcome by enhancing personal contacts between representatives of the export company and the farmer group and by working more closely with a reduced number of farmers in the subsequent season.6) A Thai partner of the Uplands Program also introduced farmers to the technique of litchi wrapping with reusable paper bags during the ripening stage in order to protect the fruits from insect damage and to reduce the need for insecticide application. This innovation is a major step towards enhancing further fresh litchi exports to the European Union with its strict food safety standards. Over a period of four years, this multi-stakeholder partnership among ethnic minority farmers, researchers, private companies and various Thai government agencies has initiated a number of technical and socio-organizational innovations that have contributed (1) to reducing the use of hazardous agrochemicals (e.g. by wrapping of litchi fruits against major pest insects), (2) to adding value to agricultural raw material (by cooperative drying), and (3) to empowering upland farmers and strengthening their socio-economic status (by helping to diversify their marketing channels and to negotiate better terms of trade). In sum, fostering these processing and marketing networks for high-value agricultural products has equipped marginalized ethnic minority farmers with new skills and more entrepreneurial attitudes and—at the same time—built social capital and fostered new forms of collective action. This has motivated the upland communities to shift to environmentally friendly agricultural practices on sloping lands, while complying with national and international food quality standards, thus contributing to land conservation in fragile mountain ecosystems. In one of their regular network meetings, key farmers have recently expressed their determination to carry on their collaborative activities beyond the Uplands Program’s funding period. The empirical evidence provided in subsection III-4 suggests that multi-stakeholder partnerships can be successfully established with the aim of combining the various dimensions of sustainable conservation and development of upland watersheds. Such partnerships have the potential to induce a socially, institutionally and ecologically sustainable mix of agricultural production, ecological services and rural livelihood opportunities, if they lead to durable forms of cooperation based on increased social trust and converging expectations among the actors. These multi-stakeholder networks require more polycentric and deliberative forms of governance (cf. Neef 2009), shared decision-making processes and a supportive legal framework. The experience of the multi-stakeholder partnerships in the two Hmong communities in northern Thailand underscores the crucial role of voluntary, non-profit-seeking intermediary actors (an international NGO in the first case, an international research program in the second) that are accepted as trustworthy mediators by all stakeholders and can help align the various actors’ expectations from the partnership and reduce power differentials among them. Such intermediaries are also essential for ensuring transparency, accountability and trust in the relations among the stakeholders. Conflicts of interests and occasional setbacks may be inevitable, particularly in the formative stages of such multi-stakeholder partnerships, but they may also motivate actors to adjust their strategies and/or diversify their relationships in the network. Questions of transferability and sustainability of such multi-stakeholder partnerships certainly remain. To date, such alliances have depended strongly on support from international actors: in the empirical case studies, FORRU and the Uplands Program have functioned as the most important nodes in the networks. While both programs have gradually reduced the influence of foreign staff members and “handed over the stick” to local stakeholders, the networks still appear somewhat vulnerable if external assistance is entirely withdrawn. Yet local researchers and national NGO staff are likely to take on the function of intermediaries, and funding could be provided by national research and development organizations. Another major challenge is the issue of scaling up such initiatives, i.e. how to combine the quality and depth of localized multi-stakeholder partnerships towards integrated watershed management with the need to reach higher levels of decision-making and address wider regional problems. This would require, first, that policy-makers at the national level and technocrats in the various government line agencies acknowledge the multifunctional character of mountain watersheds, providing not only ecosystem services for downstream residents, but also important rural livelihood opportunities, food security and social services for its inhabitants. Second, officials from the various government agencies would need to be motivated to minimize interagency competition and develop more comprehensive policies and plans—together with local administration, the private sector and upland communities—that are aimed at overcoming the (perceived) antagonism between conservation and development in upland areas of Southeast Asia. Third, the governments of Southeast Asian countries would need to relinquish at least some control over natural resources to local communities and provide codes of conduct for public-private partnerships that ensure that uplanders can strengthen their engagement with the private sector in a “level playing field” (cf. Faysse 2006). Finally, upland communities need to be seen as skillful managers of diverse asset portfolios (private, collective, regional and even global assets) and thus as key partners in the search for finding sustainable solutions to the problems facing upland watersheds. Yet this acknowledgement would really require a “watershed change” in public thinking. The support of the German Research Foundation (Deutsche Forschungsgemeinschaft) in conducting this study is gratefully acknowledged. The author got important feedback on earlier versions of this paper during a five-month fellowship at the Center for Southeast Asian Studies, Kyoto University, from April to August 2009. I am particularly indebted to my host, Prof. Yasuyuki Kono, and his research group for providing helpful comments and suggestions during various seminars. The quality of the paper benefitted greatly from the constructive comments of two anonymous reviewers. Agrawal, Arun. 2001. Common Property Institutions and Sustainable Governance of Resources. World Development 29(10): 1623–1648. Agrawal, Arun; and Ostrom, Elinor. 1999. Collective Action, Property Rights, and Devolution of Forest and Protected Area Management. [available online] URL: http://www.capri.cgiar.org/pdf/agrawal.pdf (last accessed September 12, 2010). Ahlheim, Michael; and Neef, Andreas. 2006. Payments for Environmental Services, Tenure Security and Environmental Valuation: Concepts and Policies towards a Better Environment. Quarterly Journal of International Agriculture 45(4): 303–318. Anan Ganjanapan. 1998. The Politics of Conservation and the Complexity of Local Control of Forests in the Northern Thai Highlands. Mountain Research and Developmentt 18(1): 71–82. Badenoch, Nathan. 2009. The Politics of PVC: Technology and Institutions in Upland Water Management in Northern Thailand. Water Alternatives 2(2): 269–288. Chapika Sangkapitux; Neef, Andreas; Worapong Polkongkaew; Nongkran Pramoon; Sakdamnoen Nongkiti; and Ke Nanthasen. 2009. Willingness of Upstream and Downstream Resource Managers to Engage in Compensation Schemes for Environmental Services. International Journal of the Commons 3(1): 41–63. Chiang Mai News. 2011. Growing a Forest for Wildlife 2011. [available online] URL: http://www. chiangmainews.com/e-zine/11jun2.html (last accessed October 12, 2011). Cleaver, Frances. 2001. Institutions, Agency and the Limitations of Participatory Approaches to Development. In Participation. The New Tyranny? , edited by Bill Cooke and Uma Kothari, pp. 36–55. London and New York: Zed Books. Cronkleton, Peter; Barry, Deborah; Pulhin, Juan M.; and Saigal, Sushil. 2010. The Devolution of Management Rights and the Co-Management of Community Forests. In Forests for People: Community Rights and Forest Tenure Reform, edited by A. M. Larson, D. Barry, G. R. Dahal and C. J. Pierce Colfer, pp. 43–68. London: Earthscan. Djalins, Upik. 2011. Adatt Argument and Discursive Power: Land Tenure Struggles in Krui, Indonesia. In Beyond the Sacred Forest: Complicating Conservation in Southeast Asia, edited by Michael R. Dove, Percy E. Sajise and Amity A. Doolittle, pp. 123–150. Durham and London: Duke University Press. Doolittle, Amity A. 2011. Redefining Native Customary Law: Struggles over Property Rights between Native Peoples and Colonial Rulers in Sabah, Malaysia, 1950–1996. In Beyond the Sacred Forest: Complicating Conservation in Southeast Asia, edited by Michael R. Dove, Percy E. Sajise and Amity A. Doolittle, pp. 151–179. Durham and London: Duke University Press. Edmunds, David; and Wollenberg, Eva. 2001. A Strategic Approach to Multi-Stakeholder Negotiations. Development and Change 32(2): 231–253. El-Swaify, Samir; and Evans, David with an international group of contributors. 1999. Sustaining the Global Farm: Strategic Issues, Principles and Approaches. Honolulu: International Soil Conservation Organization (ISCO) and the Department of Agronomy and Social Science, University of Hawai‘i at Manoa. London and Washington DC: Earthscan. FAO. 1976. Mae Sa Project: Conservation Handbook. Bangkok: UNDP, FAO and Royal Forest Department. Faysse, Nicolas. 2006. Troubles on the Way: An Analysis of the Challenges Faced by Multi-Stakeholder Platforms. Natural Resources Forum 30(3): 219–229. Forest Restoration Research Unit (FORRU). 2009. Forest Landscape Restoration: Mae Sa Mai—A Model Community. [available online] URL: http://www.forru.org/FORRUEng_Website/Pages/ engmodelcommunity.htm (last accessed October 12, 2011). Forsyth, Tim; and Walker, Andrew. 2008. Forest Guardians, Forest Destroyers: The Politics of Environmental Knowledge in Northern Thailand. Chiang Mai: Silkworm Books. Fox, Jefferson; Fujita, Yayoi; Ngidang, Dimbab; Peluso, Nancy; Potter, Lance; Sakuntaladewi, Niken; Sturgeon, Janet; and Thomas, David. 2009. Policies, Political-Economy, and Swidden in Southeast Asia. Human Ecology 37(3): 305–322. Francis, Paul. 2001. Participatory Development at the World Bank: The Primacy of Process. In Participation: The New Tyranny? , edited by Bill Cooke and Uma Kothari, pp. 72–87. London and New York: Zed Books. Friederichsen, Jakob R. 2009. Opening up Knowledge Production through Participatory Research? Agricultural Research for Vietnam’s Northern Uplands. Frankfurt am Main: Peter Lang. ―. 1999. Assessment of Erosion Control in Farming Systems in Northwestern Vietnam. Paper presented at Deutscher Tropentag 1999. Berlin: Humboldt Universität Berlin. Friederichsen, Jakob R.; and Neef, Andreas. 2010. Variations of Late Socialist Development: Integration and Marginalization in the Northern Uplands of Vietnam and Laos. European Journal of Development Research 22(4): 564–581. Fujisaka, Sam. 1994. Learning from Six Reasons Why Farmers Do Not Adopt Innovations Intended to Improve Sustainability of Upland Agriculture. Agricultural Systems 46(4): 409–425. Guijt, Irene; and Shah, Meera Kaul. 1998. Waking up to Power, Conflict and Process. In The Myth of Community: Gender Issues in Participatory Development, edited by Irene Guijt and Meera Kaul Shah, pp. 1–23. London: Intermediate Technology Publications. Hall, Derek. 2011. Land Grabs, Land Control, and Southeast Asian Crop Booms. Journal of Peasant Studies 38(4): 837–857. Hayami, Yujiro. 2004. Communities and Markets for Rural Development under Globalization: A Perspective from Villages in Asia. Keynote paper presented at the 85th Seminar of the European Association of Agricultural Economists “Agricultural Development and Rural Poverty under Globalization: Asymmetric Processes and Differentiated Outcomes,” Florence, September 8–11, 2004. Heidhues, Franz; Stahr, Karl; Nagel, Uwe-Jens; Thomas, David; and Neef, Andreas. 2006. Lessons Learned and Future Challenges for Integrated and Participatory Approaches to Mountain Research. Journal of Mountain Science 3(4): 347–354. Heyd, Helene; and Neef, Andreas. 2006. Public Participation in Water Management in Northern Thai Highlands. Water Policy 8(6): 395–413. Lebel, Louis; and Rajesh, Daniel. 2009. The Governance of Ecosystem Services from Tropical Upland Watersheds. Current Opinion in Environmental Sustainability 1(1): 61–68. Leimona, Beri; Joshi, Laxman; and van Noordwijk, Meine. 2009. Can Rewards for Environmental Services Benefit the Poor? Lessons from Asia. International Journal of the Commons 3(1): 82–107. Li, Tania M. 2002. Engaging Simplifications: Community-Based Resource Management, Market Processes and State Agendas in Upland Southeast Asia. World Developmentt 30(2): 265–283. Man, Norsida; and Nawi, Nolila M. 2010. The Practices of Contract Farming among Fresh Fruit and Vegetable Suppliers in Malaysia. American Journal of Agricultural and Biological Sciences 5(3): 321–330. Milder, Jeffrey C.; Scherr, Sara J.; and Bracer, Carina. 2010. Trends and Future Potential of Payment for Ecosystem Services to Alleviate Rural Poverty in Developing Countries. Ecology and Society 15(2): 4. [available online] URL: http://www.ecologyandsociety.org/vol15/iss2/art4/ (last accessed October 9, 2011). Munawir; and Vermeulen, Sonja. 2007. Fair Deals for Watershed Services in Indonesia. London: International Institute for Environment and Development (IIED). Neef, Andreas. 2009. Transforming Rural Water Governance: Towards Deliberative and Polycentric Models? Water Alternatives 2(1): 53–60. ―. 2008. Lost in Translation: The Participatory Imperative and Local Water Governance in North Thailand and Southwest Germany. Water Alternatives 1(1): 89–110. Neef, Andreas; Elstner, Peter; Chapika Sangkapitux; Chamsai, Liane; Bollen, Anne; and Jirawan Kitchaicharoen. 2005. Diversity of Water Management Systems in Hmong and Thai Communities in Mae Sa Watershed, Northern Thailand. Mountain Research and Developmentt 25(1): 20–24. Neef, Andreas; Heidhues, Franz; Stahr, Karl; Thomas, David; and Pittaya Sruamsiri. 2006. Integrated and Participatory Approaches towards Sustainable Livelihoods and Ecosystems in Mountainous Regions. Journal of Mountain Science 3(4): 271–275. Neef, Andreas; Pornsiri Suebpongsang; Manythong, Chanhsom; Wirachinee Tacheena; and Ogata, Kazuo. 2010. Can Paper Mulberry Contribute to Building Sustainable Rural Livelihoods in Northern Laos? Southeast Asian Studies 47(4): 403–425. Neef, Andreas; and Thomas, David. 2009. Rewarding the Upland Poor for Saving the Commons? Evidence from Southeast Asia. International Journal of the Commons 3(1): 1–15. Neef, Andreas; Tongroj Onchan; and Schwarzmeier, Rainer. 2003. Access to Natural Resources in Mainland Southeast Asia and Implications for Sustaining Rural Livelihoods: The Case of Thailand. Quarterly Journal of International Agriculture 42(3): 329–350. Nguyen Duy Linh; Friederichsen, Jakob R.; and Neef, Andreas. 2006. Participatory Agricultural Extension in Northern Upland Vietnam: Challenges of Coordinating Rural Service Provision and Bridging the Farmer/Extensionist Interface. Proceedings of the International Symposium “Towards Sustainable Land Use and Rural Development in Mountainous Regions,” Chiang Mai, 7–9 March 2006 (on CD-Rom). Ostrom, Elinor. 2001. The Puzzle of Counterproductive Property Rights Reforms: A Conceptual Analysis. In Access to Land, Rural Poverty and Public Action, edited by Alain de Janvry, Gustavo Gordillo, Jean-Philippe Platteau and Elisabeth Sadoulet, pp. 129–150. Oxford: Oxford University Press. ―. 1990. Governing the Commons: The Evolution of Institutions for Collective Action. New York: Cambridge University Press. Persoon, Gerard A.; van Est, Diny M. E.; and Sajise, Percy E. 2003. Co-Management of Natural Resources in Asia. Copenhagen: Nordic Institute of Asian Studies (NIAS) Press. Peters, John. 2001. Transforming the “Model” Approach to Upland Rural Development in Vietnam. Agriculture and Human Values 18(4): 403–412. Prasert Trakarnsuphakorn. 1997. The Wisdom of the Karen in Natural Resource Conservation. Development or Domestication? Indigenous Peoples of Southeast Asia, edited by Don McCaskill and Ken Kampe, pp. 205–218. Chiang Mai: Silkworm Books. Prasit Leepreecha. 2004. Ntoo Xeeb: Cultural Redefinition for Forest Conservation among the Hmong in Thailand. In Hmong/Miao in Asia, edited by Nicolas Tapp, Jean Michaud, Christian Culas and Gary Y. Lee, pp. 335–351. Chiang Mai: Silkworm Books. Röling, Nils. 2003. From Causes to Reasons: The Human Dimension of Agricultural Sustainability. International Journal of Agricultural Sustainability 1(1): 73–88. Rosales, Rina Maria P. 2003. Developing Pro-Poor Markets for Environmental Services in the Philippines. London: International Institute for Environment and Development (IIED). Saint-Macary, Camille; Keil, Alwin; Zeller, Manfred; Heidhues, Franz; and Pham Thi My Dung. 2010. Land Titling Policy and Soil Conservation in the Northern Uplands of Vietnam. Land Use Policy 27: 617–627. Schipmann, Christin; and Qaim, Matin. 2011. Supply Chain Differentiation, Contract Agriculture, and Farmers’ Marketing Preferences: The Case of Sweet Pepper in Thailand. Food Policy 36(5): 667–677. Scott, James. 1976. The Moral Economy of the Peasant: Rebellion and Subsistence in Southeast Asia. New Haven: Yale University Press. Suyanto, S.; Leimona, Beria; Rizki Pandu, Permana; and Chandler, Fiona J. C. 2005. Review of the Development of the Environmental Services Market in Indonesia. Working Paper No. 71. Bogor: World Agroforestry Center (ICRAF). Thai Thi Minh. 2010. Agricultural Innovation Systems in Vietnam’s Northern Mountainous Region: Six Decades Shift from a Supply-Driven to a Diversification-Oriented System. Weikersheim: Margraf Publishers. Thongmanivong, Sithong; Fujita, Yayoi; Phanvilay, Khamla; and Vongvisouk, Thoumthone. 2009. Agrarian Land Use Transformation in Northern Laos: From Swidden to Rubber. Southeast Asian Studies 47(3): 330–347. Tran Duc Vien; Leisz, Stephen J.; Nguyen Thanh Lam; and Rambo, Terry. 2006. Using Traditional Swidden Agriculture to Enhance Rural Livelihoods in Vietnam’s Uplands. Mountain Research and Development 26(3): 192–196. Tremblay, Anne-Marie; and Neef, Andreas. 2009. Collaborative Market Development as a Pro-Poor and Pro-Environmental Strategy. Enterprise Development & Microfinance 20(3): 220–234. Tyler, Stephen R., ed. 2006. Communities, Livelihoods and Natural Resources: Action Research and Policy Changes in Asia. Ottawa: Practical Action Publishing & International Development Research Centre (IDRC). Vandergeest, Peter. 2006. CBNRM Communities in Action. In Communities, Livelihoods and Natural Resources: Action Research and Policy Changes in Asia, edited by S. R. Tyler, pp. 321–346. Ottawa: Practical Action Publishing & International Development Research Centre (IDRC). ―. 1996. Property Rights in Protected Areas: Obstacles to Community Involvement as a Solution in Thailand. Environmental Conservation 23(3): 259–268. Vermeulen, Sonja; Woodhill, Jim; Proctor, Felicity; and Delnoye Rik. 2008. Chain-Wide Learning for Inclusive Agrifood Market Development: A Guide to Multistakeholder Processes for Linking Small-Scale Producers to Modern Markets. London: International Institute for Environment and Development (IIED). World Resources Institute. 2003. Biodiversity and Protected Areas: Thailand. Earth Trend Country Profiles. Washington DC. [available online] URL: http://earthtrends.wri.org/pdf_library/country_profiles/bio_cou_764.pdf (last accessed April 6, 2009). Wunder, Sven. 2005. Payments for Environmental Services: Some Nuts and Bolts. Occasional Paper No. 42. Nairobi: Center for International Forestry Research. Ziegler, Alan; Fox, Jefferson; and Xu, Jianchu 2009. The Rubber Juggernaut. Science 324: 1024–1025. 1) Upland areas and their associated watersheds in Southeast Asia are defined in this paper as areas that range from 500 m above sea level to high-elevation mountains and are characterized by high ecological fragility, ethnic heterogeneity and various degrees of socio-political and economic marginalization. 2) Studies on the impact of contract farming on Southeast Asian smallholders’ livelihoods are inconclusive. In a study on sweet pepper contract farming in a northern Thai watershed, Schipmann and Qaim (2011, 676) find, for instance, that “contract marketing channels are associated with higher net incomes.” Yet the study could not determine any statistically significant gross margin differences between company and village trader contract suppliers. Their findings also suggest that farmers generally prefer non-contract marketing options. This result is supported by a study on contract farming of fruit and vegetable in Peninsular Malaysia (Man and Nawi 2010). 3) In the case of contract farming, trust between suppliers and buyers is also deemed indispensable (cf. Schipmann and Qaim 2011). Yet the issue of trust becomes even more important when the number of actors in the socio-economic network increases, which calls for neutral and trustworthy intermediaries that help aligning actors’ expectations and leveling power differentials among them. 4) Litchi trees were regarded as a more sustainable land management practice by national park authorities and other government officials and they therefore equipped villagers with some form of tenure security in the absence of legal ownership rights. 5) The Uplands Program is a Thai-Vietnamese-German collaborative research program that has conducted research into sustainable land use and rural development in mountainous regions of northern Thailand and northern Vietnam since July 2000. The interdisciplinary program comprises more than 10 subprojects, spanning from agro-ecology, horticulture and fruit processing to economics, development policy and rural sociology. 6) It is expected that the number of exporting litchi growers will increase again in the future, when the exporters have regained their trust in the farmers’ network. International demand for fresh, GlobalGAP-certified litchi from Thailand exceeds the current supply.